Aircraft loads is an essential component of the design cycle. TLG’s in-house DERs and engineering staff can take care of all of your loads need for you. Including loads early is key to reducing program risk and cost by avoiding potentially expensive re-work later in the program. It allows you to have better information when making critical early design choices. TLG can be “The Loads Group” for any project. WHEN DO YOU NEED LOADS? There is a need for loads on day one for avoiding potential pitfalls in your aircraft design and certification process. 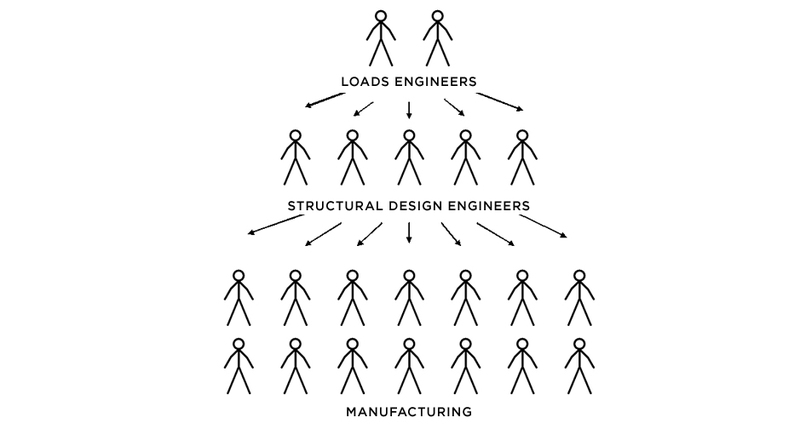 Furthermore, loads is essential to nearly all stages of a design program. Early in preliminary design, the structural designers need initial loads to size preliminary structure. As the design iterations progress, the detail and fidelity of the loads increases. The final step for an aircraft is a full set of certification loads for submission to the FAA and EASA. The work of the loads group drives the stress and structural design groups; organizations that are often much larger than the loads group. As a result of this, changes to loads inputs after a substantial portion of detailed design is complete can necessitate a significant amount of rework. Let TLG work with your organization through the early stages of the design process in order to minimize the potential for expensive surprises in the design and certification of your project. Aircraft loads are those forces and moments, or loadings, applied to the airplane structural components (the wing, horizontal tail and the fuselage, for instance) to establish the required strength level of the complete airplane. These loadings may be caused by air pressure (lift), inertia (mass, weight) forces or ground reactions during take offs and landings. The determination of design loads involves a full aircraft analysis of the air pressure and inertia forces during certain prescribed maneuvers, either in the air or on the ground. TLG is capable of determining these loads for all kinds of aircraft in all manner of flight conditions. WHAT INFORMATION IS NECESSARY TO CALCULATE LOADS? One of the challenges in calculating loads is that the full aircraft must be accurately modeled. The primary basic data to the loads analysis are accurate airplane geometry, aerodynamic data, weight (inertia) data, design speeds, stiffness data, miscellaneous systems data, operational data and regulations and requirements. This makes loads a multidisciplinary process. Early in a design program, these parameters can be estimated from various methods, but when using estimations, the engineer will err on being conservative, so the loads will be higher than certification level loads. As the design becomes more detailed and defined, the loads will become more concise to the final certification level. HOW DO YOU CHOOSE THE FLIGHT CONDITIONS FOR LOADS? The overall guidance on loads is the CFR 14 Part 23 and 25 regulations, requiring the aircraft to be structurally sound for a specific set of flight conditions. The loads analysis needs to cover all possible combinations of speed, altitude, flap angle, airplane gross weight, airplane center of gravity, passenger and payload distribution, fuel quantities, engine thrust and airbrake positions for each of the required maneuver and load cases for each part of the airplane. An example of a load condition is for the pilot to suddenly roll the airplane while flying at 20,000 feet altitude, a speed of 300 knots, full engine thrust, airbrakes retracted, flaps and slats retracted, five passengers sitting in the forward most seats, half full wing fuel tanks and maximum allowed cargo. Adding up all of the possible combinations, there are thousands of unique load cases. WHAT DIFFERS BETWEEN STATIC AND DYNAMIC LOADS? Static loads are calculated for conditions when the aircraft is at steady state and range from high speed dives to low speed stalls. The dynamic loads are how the airplane responds to gusts and bumps, including landing. Dynamic loads are more prominent on large, flexible airplanes because of the structural response. For example, the gust may simply accelerate the aircraft up briefly, but the frequency of the gust will cause the wing to bend in a certain mode shape, and the resulting vibration then induces more loads on other parts of the structure due to both aerodynamic and inertial forces. HOW MANY LOADS CASES NEED TO BE RUN? For an aircraft, the combination of static and dynamic loads, with the range of the flight envelope, all payload loading conditions and flight maneuvers results in hundreds-of-thousands of load conditions. TLG has developed an extensive set of tools to facilitate quickly setting up and running thousands and thousands of static and dynamic loads cases and then quickly post-processing to obtain the most critical load cases to provide loads envelopes to the stress and structural engineers. TLG utilizes in-house loads programs and MSC.Nastran for loads determination.